DJI introduced the new Osmo Mobile 2. 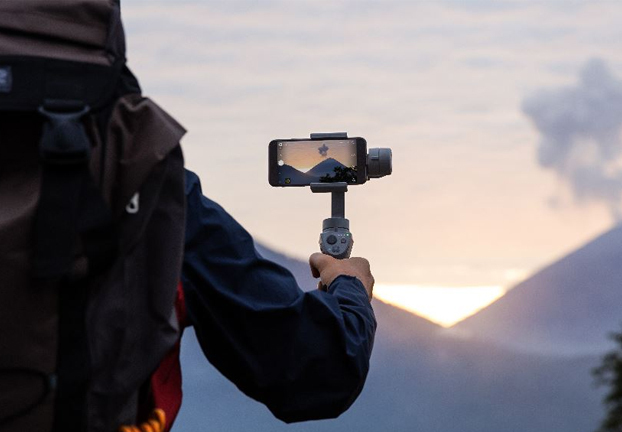 Osmo Mobile 2 is a smartphone camera stabilizer that captures videos and high-definition panoramas with cinematic movement and ease. DJI’s three-axis gimbal technology cancels out movement in three directions so the video stays steady even if the hands shake or wobble, while DJI’s built in SmoothTrack technology detects and compensates for the movement of the camera to ensure a smooth cinematic shot. Designed to be lightweight and portable, Osmo Mobile 2 is made from modified nylon and features a folding design. The two-way mobile clamp lets one pivot between landscape and portrait orientation. In addition, a 1/4” universal screw mount ensures compatibility with any photography accessories. Controls let one use the phone’s camera like a professional camera with integrated settings for ISO, shutter speed and others. A new zoom slider lets one operate a smartphone camera from the handle. A built-in battery system lets one film for up to 15 hours, over three times longer than the original Osmo Mobile’s battery. The new USB port enables phone charging during use and serves as a power bank for charging other electronics while on the go. Smart software in the DJI GO mobile app unlocks intelligent photo and video features. Videographers can use modes including ActiveTrack to automatically follow of subjects in motion, Motion Timelapse with up to five different camera positions, Hyperlapse to create time-lapse videos with the camera in motion, or stream live to social platforms like Facebook and YouTube. Photographers have options such as Panorama, Long Exposure and LightTrail modes. Osmo Mobile 2 retails at P7,900 and is locally distributed by MSI-ECS. To know where to buy the new Osmo Mobile 2, call (02) 688-3512 or email marketing@msi-ecs.ph.